NORD DRIVESYSTEMS goes mobile: With the NORDCON APP and the corresponding “NORDAC ACCESS BT” Bluetooth stick the drive specialist has created a mobile commissioning and service solution for all NORD drives. In a mobile age, customers increasingly expect mobile solutions for efficient handling of the installed drive technology directly on site. NORD DRIVESYSTEMS has catered for this requirement and has developed an app for diagnosis, analysis, monitoring and parameterisation of NORD drive systems. 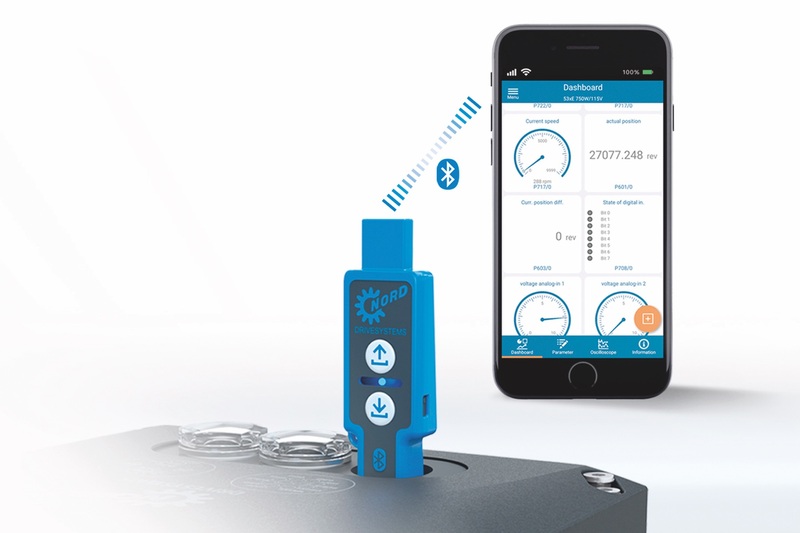 The new NORDCON APP together with the NORDAC ACCESS BT Bluetooth stick provide a mobile commissioning and service solution and give users new options for control and optimisation of their NORD drives. This speeds up commissioning, simplifies maintenance and enables faults to be remedied faster. With this, down times and costs can be reduced. The dashboard-based visualisation is useful for drive monitoring and fault diagnosis. With a help function and rapid access to parameters, parameterisation of drive units is simple and easy. In addition, the app has further practical features such as a backup and recovery function for simple handling of drive parameters, as well as an individually configurable oscilloscope function for analysis of the drive. Video tutorials and the possibility of direct contact with NORD Support additionally assist users in their work. The NORDAC ACCESS BT acts as a bridge between the drive system and the app. The stick is connected to the software via Bluetooth and is used directly on the frequency inverter. Users therefore have practical access to the drive data and remain in full control of access. The NORDAC ACCESS BT can also be used without the app, for example to save parameter data. If the frequency inverter is damaged or the the drive has to be replaced, the original parameters can be easily uploaded from the stick. Parameter transfer between a drive and a PC is also possible. The NORDCON APP and NORDAC ACCESS BT are available for all NORD drive electronics and can therefore be used with decentralised frequency inverters as well as control cabinet solutions and with optional modules. The app is available for iOS and Android operating systems in the App Store or in Google Play.